Memory is often the primary evidence in the courtroom, yet unfortunately this evidence may not be fit for purpose. This is because memory is both fallible and malleable; it is possible to forget and also to falsely remember things which never happened. The legal system has been slow to adapt to scientific findings about memory even though such findings have implications for the use of memory as evidence, not only in the case of eyewitness testimony, but also for how jurors, barristers, and judges weigh evidence. Memory and Miscarriages of Justice provides an authoritative look at the role of memory in law and highlights the common misunderstandings surrounding it while bringing the modern scientific understanding of memory to the forefront. 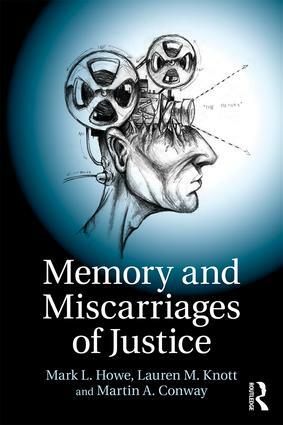 Drawing on the latest research, this book examines cases where memory has played a role in miscarriages of justice and makes recommendations from the science of memory to support the future of memory evidence in the legal system. Appealing to undergraduate and postgraduate students of psychology and law, memory experts, and legal professionals, this book provides an insightful and global view of the use of memory within the legal system. Prof Mark L. Howe holds a Chair in Cognitive Science at City, University of London, UK. His research on memory has addressed questions concerning memory development, memory illusions, the emergence and adaptive functions of memory, links between reasoning and memory, memory in traumatized and maltreated children, as well as memory and the law. He has published numerous peer reviewed articles and book chapters on memory, as well as authored and edited a number of books. Dr Lauren M. Knott is a Senior Lecturer in the Department of Psychology at City, University of London, UK. She specialises in the investigation of false memory development in children and the role of retrieval processes in false recognition. Prof Martin Conway is the Head of Psychology at City, University of London, UK. Having researched human memory for over 32 years he has published numerous papers, books, and articles as well as making contributions to television, radio, and newspapers.